JM: Here we are with the cream of the crop, the most incredible and complicated of the year. And as can be expected, the decision will not be easy. In the Mechanical Exception category there are six watches that on any given day could easily be praised for showcasing extreme watchmaking skill and pushing the boundaries of fine watchmaking. But our job is to sort through the gold to find the diamonds. RS: I love this category, Joshua. The sheer firepower that it tends to draw in is a delight, and what a top six we have! There is comedy, quirk, and three exceptional chiming watches. Surely this year’s winner will have hammers and gongs! AG: Sometimes there is so much going on . . . brands trying to impress us with the most complications, the thinnest this, the biggest that, the loudest chime, etc. that I feel that I’m getting horological indigestion, though! AT: I love the mechanical exception category as it gets to show off the best of the best that the watchmaking world has to offer. IS: This year is in danger of turning into a vintage one for the GPHG: this is another category in which all six pre-selected watches are absolutely fantastic. Picking a top three is extremely difficult. JM: I have a clear winner thanks to my position on what this category should highlight, but the other watches are by no means less deserving of the title. I expect a close race this year between our panelists and the actual GPHG jury. My fingers are crossed that my choice will win because I believe it deserves it, but I would be equally happy for any of the competitors to win! MG: There are moments that I am happy that I am not a part of the GPHG jury and this is one of them. What an incredible lineup in this category! They are all winners, all dream watches . . . all as good as it gets and then some. They show the haute horological muscles of the industry in an unprecedented way. AT: This is such a great watch. I really wish it would win the category, but I don’t know if the jury will be on my side. It’s so much fun while being horologically brilliant. It is also much more attractive than the standard Chaykin Joker. The way of displaying the time is novel, and the automaton is a great horological complication. A real delight in my opinion. IS: I love the totally irreverent attitude displayed on both front and back of the Andersen Genève & Konstantin Chaykin Automaton Joker, and the card-playing automaton on the back certainly meets the criteria of “mechanical exception.” But in this highly competitive field it will take more than putting a smile on our faces to win. RS: Combining these two independent watchmakers feels so right. Both have an old-world aesthetic coated with a thick layer of whimsy. A timepiece doesn’t get much more playful than this, and I must say it’s probably the guy wearing this watch that I would most likely want to talk to out of the competition. That said, this feels like a cake made only from icing, no sponge! What I love about Andersen’s usual automata is that is hides behind an otherwise unassuming façade; and what I love about Chaykin’s joker, other than the dial, is the case. The bar lugs on this version are just too fancy for me; I need some sponge! MG: What happens when you combine two grandmasters who love the unconventional? A joker!! Andersen and Chaykin play so well off of each other to create an absolutely ridiculous watch that honors both the innovation but also the tradition of watchmaking. A brilliant watch and my personal favorite in this category, even if only by a hair! JM: The Andersen Genève/Chaykin Automaton Joker is a watch that will always be divisive since its inspiration – the Konstantin Chaykin Joker – was a favorite of many, but also a sore spot to others who view horology as inherently serious. But when viewed in the context of the Mechanical Exception category, the piece fails to excite on the levels of some other pieces. The display of the automaton is rather subdued, and the purpose is only for fun. I love the watch, and think it definitely deserves to be recognized for its playful ingenuity, but I feel that the competition has this one beat. For more information, please visit gphg.org/horlogerie/en/watches/automaton-joker. AT: I very much like minute repeating watches; they constitute one of my favorite complications. I’m not sure what to make of this one. You have an idea in your head of what a minute repeater “should” look like, and this is not it. I wouldn’t wear it, but the fact that it is so different does do something for me. IS: I drank the Bulgari Octo Finissimo Kool-Aid and am a big fan of virtually every Octo Finissimo model created; however, I believe the Minute Repeater Carbon goes too far. While I haven’t heard a carbon fiber-encased minute repeater, I can’t help but imagine it as up there with plasticine and a hard cheese as being a poor resonator of sound. I can imagine a carbon fiber resonating board, but not a resonating case. RS: While this is an astounding watch, it is essentially the same as the model from this same category in 2016. If this were a case-material category, I would have more to say here. MG: Don’t they ever stop at Bulgari? Super watch after super watch. What I love about this minute repeater is that it is, of course, thin, but it is not something to which everything was sacrificed. The watch still sounds very good, and the timing of the hammers is spot on. It is also very nice to see a minute repeater taken out of the usual classical proposition and put into something very avant-garde! JM: The Bulgari Octo Finissimo is sort of a GPHG favorite with watches that have won in more than one category or one year. It is hard to ignore the super-slim profile, ultimate lightness, and in the case of the Minute Repeater Carbon the impressive inclusion of a minute repeater in such a thin, light case. If Bulgari does one thing well, it is squeezing horological awesomeness into a thin package, and it was done again with this piece. But I feel that this watch is almost becoming par for the course for both Bulgari and the Mechanical Exception category. It is truly amazing and would deserve recognition any day, but it is up against some real monsters this year, and I feel it doesn’t have enough momentum to take the top spot. For more information please visit gphg.org/horlogerie/en/watches/octo-finissimo-minute-repeater-carbon. JM: I have carried the torch for Bovet and the Récital series for years as it stands as one of the most elegant and incredible skeleton-style creations in high-end watchmaking today. The Récital 22 Grand Récital is another fantastic watch that deserves the community to see exactly what it has accomplished. As everyone should know by now, I love the moon and any new attempt at creating a unique moon phase. Well the Récital 22 Grand Récital goes a step further and creates a very interesting orrery style with a moon slowly orbiting around a rotating earth to display not only moon phase, but orbital position relative to the sun. The tourbillon represents the sun, while also acting as the running seconds. If that was all this watch did, it would still be great. But it goes so much further: it has retrograde minutes and jumping hours to keep the time display from covering the awesome orrery on the dial, balancing that display with the power reserve. AT: Ultra-complicated is the only way to describe this complication masterpiece of note that manages to stay elegant despite everything it has going on. JM: On the rear of the watch, like all Récital pieces, we find even more complication displays, with a full perpetual calendar in an easy-to-read layout. The entire watch is magnificent and could easily win the category. I personally think that another deserves the top spot for its sheer engineering creativity, but if the jury chose Bovet I would also be happy. IS: Bovet has really hit the ball out of the park with its Récital collection, and when it comes to mechanical exceptions a nine-day flying tourbillon with tellurium-orrery and retrograde perpetual calendar scores ten out of ten in my book. Horologically, the Bovet Récital 22 is a star among stars, but it also looks fantastic: the angled case, hemispherical planisphere, retrograde indications, and prominent flying tourbillon all flow together in a coherent ensemble. This is a lust-worthy wristwatch and I love it, but in this competition it gets my vote for tied number three (with the Girard-Perregaux Minute Repeater Tri-Axial Tourbillon). RS: As mentioned with the Automaton Joker, I am not a fan of bar lugs, and this is often the great barrier I have to overcome to appreciate the genuine clout that Bovet brings to the table. Today it’s an easier challenge, what a beast this is! I really like how Bovet executes its flying tourbillons and the way it has made the carriage resemble the sun is beautiful. Funnily enough it’s that retrograde date complication I hold in particularly high regard; I am not a friend of Rolex’s “cyclops,” but here it feels perfectly apt. I am also shocked as to how the brand has managed to deliver nine days’ worth of autonomy with these complications from just one barrel! My criticisms of the watch are twofold. First, the somewhat illogical layout: the nine-day reserve indicator feels like it should have been retrograde hours to mirror the minutes. Second, while the tellurium is impressive, I have seen better. And I’m aware of how harsh that sounds, but we have to make some tough choices here, so I am being tough. MG: For the small town that is Fleurier, there are so many candy stores, and Bovet is one of them! A delightful watch, not only regarding complications but also how they are presented, which is highly original and with a clear and individual signature. I also love how organically Bovet has balanced the design, which is as complicated to achieve as it looks! For more information please visit gphg.org/horlogerie/en/watches/recital-22-grand-recital. AT: This can be such a difficult category to judge as the watches on offer are all so exceptional. This GP is another example of that with an impressive tourbillon and minute repeating complication. Aesthetically, though, it’s a sea of grey, which doesn’t evoke an emotional response within me and it just doesn’t stand out. RS: At 48 mm it’s almost unbearably large. But that is the correct size for watches of monstrous clout and presence! This watch has the symmetry and logic on the dial that the Bovet failed to deliver, a little more pivot in its tourbillon than the Greubel Forsey, and I am going to place a bet that the architecture of this watch makes it the most pleasing to the ear compared to its chiming counterparts. The view of the tourbillon and the repeater mechanism on the dial fits the brief for mechanical exception. This is the winner in my opinion. 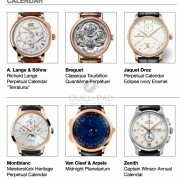 MG: Yes, Girard-Perregaux! Show them what you are worth and that you still more than belong among the top Swiss brands. The only comment that I have is that the watch doesn’t really have a Girard-Perregaux signature look. That might be something to improve on to more clearly mark a territory in the world of haute horlogerie. IS: This category is for watches featuring exceptional mechanics, and in the world of horology it doesn’t get much more exceptional than a triple-axis tourbillion. But to partner that with a minute repeater is an outstanding achievement. At 48 mm diameter the watch is large, but titanium keeps the weight down – and resonates the repeater better (unlike Bulgari’s carbon-encased repeater). And after saying all that, highlighting just how competitive I find this year’s pre-selected exceptional watches, is the fact that the Girard-Perregaux Minute Repeater Tri-Axial Tourbillon gets my vote for a tied third place (with the Bovet 1822 Récital 22 Grand Récital). JM: The ability of Girard-Perregaux to fit a tri-axial tourbillon – a rather large mechanism on its own – into a case with a minute repeater is rather impressive. The style and mechanics are on full display, something I will always love with watches in this category. Objectively, the Girard-Perregaux Minute Repeater Triaxial Tourbillon is a fantastic timepiece that highlights its mechanism accomplishments and provides a slew of improvements over a traditional minute repeater for better sound propagation. But given the competition, it still falls short of taking the top spot, which is hard to believe. This category can be a heartbreaker for teams of engineers and watchmakers that dedicate themselves to creating awesome things. For more information please visit gphg.org/horlogerie/en/watches/minute-repeater-tri-axial-tourbillon. AT: Some people absolutely love the styling put forth by Greubel Forsey, while others do not. However you feel that you cannot deny this watch is a horological beast! I really don’t have anything else to say as it speaks for itself. The clear winner. RS: This watch is utterly beautiful: the pusher in the crown, the rotor, the tilted tourbillon, the stellar finish . . . this is the watch I would walk away with in the event of a fire! But – and I can’t believe I am saying this – it’s not my pick for the win. MG: I have had the pleasure of enjoying this watch on the wrist at a few occasions, and that wasn’t nearly enough! It is very, very hard to have favorites among the collection of Greubel Forsey, but this might just be it. Very well executed, intuitive to use, and with a flawless finish: a watch that was worth the more than ten years it took to develop it! IS: Ohhh, how I so much wanted to pick the Greubel Forsey Grande Sonnerie as my winner of this category, but felt it was pipped at the post. And I’m still not certain that I made the right decision. While we judge watches on many factors, a chiming watch should be judged first and foremost on the sonorous quality of its chimes. And I can report first hand on hearing three different models in very different environments and contexts that the Greubel Forsey Grande Sonnerie sounds fantastic. And my high bar had previously been set by the Audemars Piguet Supersonnerie. Sensational hand finishing, innovative safety and technical features, and a sublime look that merely hints at the quality within rather than shouts its presence. I love the Grande Sonnerie and it’s my number two pick (by a whisker). JM: Greubel Forsey always makes it onto my finalist lists in whatever category it enters because the pieces are always impeccable, finished to the nth degree, and ultimately creative in whatever they has been attempted to revolutionize. The Grande Sonnerie is no different. With Greubel Forsey having a go at what is considered the hardest watch to build, it should be no surprise that it has been made it not only better, but it looks cooler than many. And sounds amazing. If I had to have a complaint, it would be that so much of the movement is hidden from view because I like to see mechanics. But that is nit-picking at its most obvious. The watch represents years of hard work and innovation as well as a new step for an already incredible brand. And it is with a heavy heart that I will say I still don’t believe it is the “best watch” in the Mechanical Exception category, at least in my eyes. I would not for one second be disappointed it if won, it is truly deserving of recognition, but in the Mechanical Exception category, there are always spectacular watches that lose to other spectacular watches, and this year is no exception. See what I did there? For more information please visit gphg.org/horlogerie/en/watches/grande-sonnerie. AT: It took me a while to decide whether I liked this watch or not and I’m still not convinced either way. It is certainly innovative and out there! AG: The Freak gets my vote; I’ve always liked the watch intellectually but never the implementation. With this new redesigned version you get a sleek, viciously cool watch. RS: I feel very harsh not picking the Freak Vision as my favorite. The entire range has pioneered innovation and this model is no different. If this were an innovation award it would win hands down, but there is something about the term “mechanical” that lends itself to some of the more traditional offerings in this group than this piece of alien technology. I love it all the same. MG: Ulysse Nardin keeps improving its Freak, and this is a very sweet creation! The way that the brand’s engineers now have integrated an automatic winding system is absolutely superb and makes the watch even more desirable. Combined with the carrousel the whole proposition of the watch is on par, and it also has good looks to go with it. I have always been a sucker for blue, so that makes this watch right up my alley. IS: The category is called “Mechanical Exception,” and as strongly I was drawn to voting for the Greubel Forsey Grand Sonnerie, or even weaseling out and calling it a tie for first place, when it comes to mechanical exception the Freak Vision has the edge on innovation. The Grinder winding system, constant force silicon balance wheel with nickel mass elements, and stabilizing micro blades all in a flying carrousel rotating movement is unlike anything seen before. The Freak as a concept might be getting on now, but the Freak Vision has more than enough new technology that it gets my vote as the best Mechanical Exception watch for 2018. JM: I think the purpose of the Mechanical Exception category is to encourage innovation and research into watchmaking, its methods, and everything surrounding the creation of the objects we love. That is why whenever there is an Ulysse Nardin Freak in the mix, it is a good chance the rest of the watches will lose. The entire purpose of existence for the Freak is to test out a whole bunch of creative ideas about materials, functions, displays, and processes. The Freak Vision does not disappoint (well, it did disappoint many, but that is because it is still tough to embrace change). The innovations included in the Freak Vision are many and include efforts to increase precision, efficiency, and mechanical capability. The winding system is entirely new and better than anything before (it seems) and the combination of balance, escapement, and gear train innovations should lead to practical solutions that are implemented into every UN watch one day (the last batch of innovations has so far had a 7 of 10 implementation rate). The Freak’s style may not be for everyone, but it is hard to argue with the sheer innovation presented in the Freak Vision. That is why I feel it is very likely to take the top spot, as long at the jury is properly educated about the piece. For more information please visit gphg.org/horlogerie/en/watches/freak-vision. It’s Bovet Recital 20 Asterium on the wristshot, not the Grand Recital. 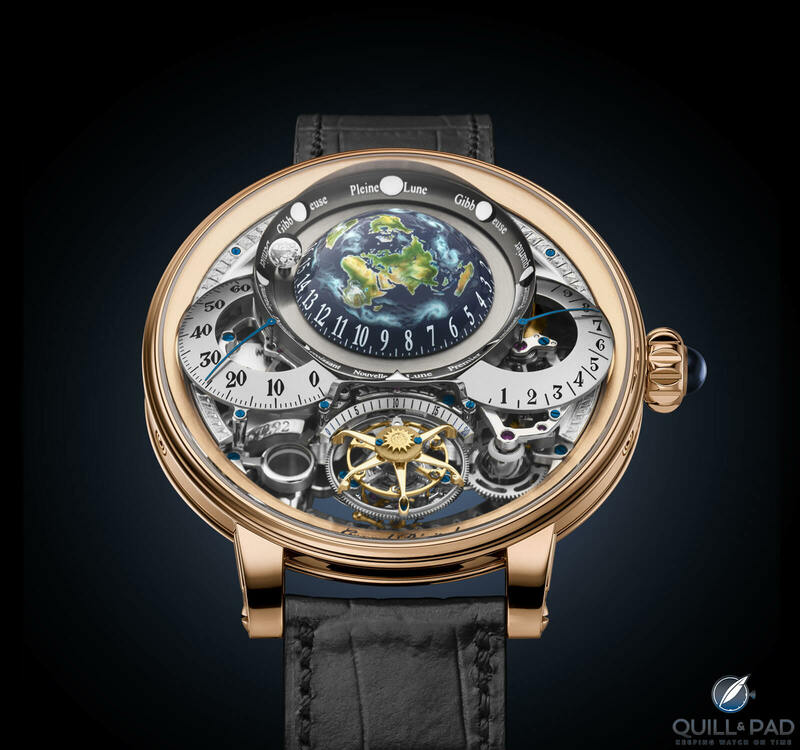 An excellent overview, love the Freak Vision, but also wish the victory for Bovet or GF! This is tough! My head says the freak, my heart says the GP or the Bovet. Everyone in this group is an amazing watch in their own right. So I don’t think I’ll be too worked up whoever wins. Great watchmaking is the winner here. GF for me. If the Freak Vision were completely new, it would have my (sadly valueless) vote, but the Freak has, to my mind, now been worked to death.